​I am amazed – and thankful – every day that God can make use of this broken soul to minister to others. It is my greatest honor to, in some small way, be able to serve our Heavenly Father with Sweet To The Soul. But one of the things I am most grateful for is my family and the legacy of their commitment to kingdom service. I know this special upbringing and the time I have spent with my parents, aunts and uncles and cousins -- the countless hours spent listening to family members preach from the pulpit as well as in their everyday lives; all of the prayer and praise that spontaneously accompanies every family gathering; and all of those hours spent learning and worshiping in little Southern churches – has left an impression of God upon my life which plays a sweet melody as clear as the ridges of a vinyl record. Growing up in a faithful family such as this is a gift indeed, but even more so for me as I was not born into this family. God picked me up right where I was and firmly planted me into this special family of His children. Adoption is an amazing demonstration of God working out His will for a family and a child and the most God-like expression of love someone can have for another. But even if your family legacy is different from mine, you can rejoice and thank God for being adopted into His family and being called a child of God. As children of God we can also serve the Lord in the company of our ancestors – Moses, Noah, Ruth, David, John, Peter, Paul [just to name a few family members]. Yes, as children of God, we share a rich family legacy of kingdom service. Join the conversation about our families, and comment below. 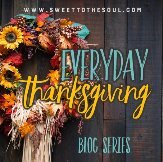 Today's blog post is part of our November series #EverydayThanksgiving. Yes! More than anything, I want to pass on a legacy to my kids - a legacy of loving God and Kingdom service. I am so thankful that God we can establish that foundation for the future generations of our family. God is so good! Yes, me too. And now with grands, that's just so much more important to me. Growing up, I know now, I really took for granted the faith of my family. I just thought everyone's family was like mine. I know now just how big of a blessing they have been.